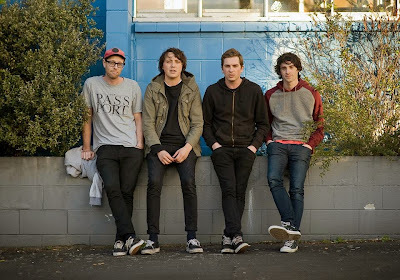 A Pessimist Is Never Disappointed: Play Rockin' Cut From New Zealand's Surf City Here! Play Rockin' Cut From New Zealand's Surf City Here! Writing about a New Zealand band is a hard task 'cause invariably one reaches for bands on the Flying Nun label for comparison even if the new band in question is not on the Flying Nun label. Well, the reality is that New Zealand's Surf City sound a lot like late-period The Clean. And that's a helluva compliment as far as I'm concerned. Shambling in all the right ways, with near-psychedelic guitar licks throughout, "Hollow Veins" is a nice little taster for the upcoming Surf City album, Jekyll Island. That record drops on March 23, 2015 via Fire Records. After spinning this one, prepare yourself for the release of their new album by following Surf City on their official Facebook page.